According to new forecasts from GlobalData, the global number of Internet of Things (IoT) connections will reach 4.5 billion by 2023, dominated by short-range and cellular connections and with a five-year CAGR of 28%. This is only moderately good news for mobile operators, which will see cellular connections grow by only a CAGR of 16% over five years. More importantly, connectivity is only expected to generate 5-10% of total IoT revenues predicted by GlobalData at $317 billion by 2023. While mobile operators certainly made a lot of announcements (and showed a lot of demos) about trials, use cases, and upcoming plans for 5G, there were also a lot of other topics on the table. Other announcements focused not only on existing services (e.g., 4G, IoT), but also on changes deemed necessary for operators’ future success, focusing on collaboration, simplification, and internal transformation. What’s New in Enterprise Mobility Services? • The enterprise mobility services market is often seen as a cash cow, with a relatively static set of offerings hampered by a number of commoditized market segments (e.g.,a MDM), with few innovative service introductions. • However, GlobalData’s latest analysis of this market shows clearly that there are still new often-innovative capabilities being introduced by operators that not only help business customers but also provide market differentiation. According to GlobalData, the global market for business-focused Internet of Things (IoT) technology, which consists of software, services, connectivity, and devices, reached $130 billion in 2018, and it is projected to reach $318 billion by 2023, a CAGR of 20%. This forecast has implications both for IoT vendors and service providers as well as for the enterprises that will use their products and services to achieve operations improvements, cost reduction, and eventually revenue-generating products and services of their own. 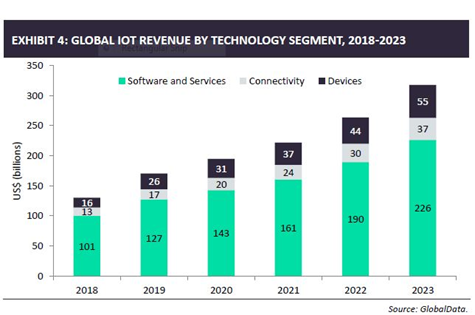 GlobalData’s latest IoT forecast splits out technology into three segments: software and solutions, connectivity, and devices. • Sigfox, while one of the first LPWAN providers, has been hampered by business and organizational problems, and faces significant competition from LoRa, LTE-M, and NB-IoT alternatives. • At its annual Connect event the service provider hoped to turn the tide with good news about coverage and traction and a spate of service and network-related announcements. At its Connect event in Berlin on October 25th, Sigfox sought to displace the growing concern that it is running last in the global race to provide LPWANs, in the face of standardized licensed spectrum alternatives NB-IoT and LTE-M, as well as networks based on competitive LoRaWAN technology, all of which have been gaining ground. The following public announcements from the event show a range of focus areas for the service provider, notably highly accurate, global location-based services for asset tracking, along with technologies that enhance its network performance and ease of deployment benefits. • New Micro Base Station. The Access Station Micro provides an adaptable and easy-to-install solution to significantly enhance Sigfox IoT service coverage to billions of devices. A single gateway could cover large rural areas, hundreds of square kilometers without effort. Its extremely low energy consumption enables remote IoT applications where no power source is available with a single small solar panel and a low bandwidth satellite backhaul.